At the 2014 London Swine Conference, Ronald O. Bates of Michigan State University explained the decisions swine producers must make if they plan to transition to group sow housing. Dependent on legislative mandates or market forces many pork producers across North America must transition from housing gestating sows in stalls to group sow housing, often within the next five to 10 years. Pork producers are faced with many decisions in making this transition and these decisions are interconnected. Unfortunately, the cost incurred will not be offset by an increase in market price but the cost of this transition may be the price to be paid to remain in business. potential changes to production expectations. Throughout North America the pig industry is currently undergoing the most significant shift in production practices since the middle of the 20th century as it transitions from individual housing to group housing of gestating sows. A combination of legislative actions and customer purchasing decisions is driving this change. More recently, numerous retailers and food service chains that purchase or distribute pork products including McDonald’s, Oscar Mayer, Kroger, Sysco and Tyson have announced that they are encouraging their suppliers to transition from individual stalls to group housing for gestating sows. Depending on the legislation or retailer, many pork producers must implement changes to sow housing between 2017 and 2022. This change is not simply a matter of changing physical housing systems by replacing individual sow stalls with group pens. Genetic selection decisions in the pork industry over the past several decades have focused on production traits assessed on an individual animal basis and there is growing evidence that sows selected on this basis do not function or perform well in a group-housing environment. To make this change, pork producers will have to re-think how they manage sows. 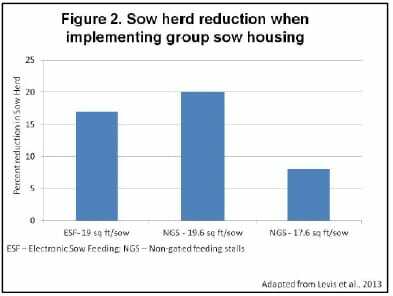 Evidence exists that overall sow productivity can remain similar to that experienced when housing sows individually. However, successful management of sows in groups will be different than when managing sows individually in stalls. Pork producers will have to improve their understanding of sow behaviour and work toward managing sows individually, though housed in groups. What will be the status of the sow herd and will the present building shell be used or will additional space be added or a new barn built? What are the financial resources for the project? What type of feeding/housing system will be used? What is the design specification for floor space allocation per sow? What is the design specification for the number of sows per pen? How will animal management and employee training change? Will productivity change and if so, how will this affect subsequent cost of production and long-term profitability and viability? Under each of these categories are many subcategories that will also have to be addressed. However, these points can provide the framework of putting together a transition plan from individual stalls to group sow housing. Decision-making will not be linear and many of these topics are interconnected. Though the following discussion will be linear in nature, many of these topics must interact with each other to come to a decision regarding the transition to group sow housing. Farms that consider this transition must be realistic in what the initial capital costs will be and productivity changes that may occur which could alter cash flow. As with any project of this type it is realistic to assume that there will be a period of time where cash expenditures will increase and earnings may be reduced. Farms that are in good equity positions should be able to work with their lender and develop a reasonable transition plan that would include cash flow assistance over the time period of remodelling/construction when expenditures could increase as well as some type of sensitivity analysis that would show how earnings could fall. This will help the lender understand how operating loans may need to change while the farm works through this transition. Farms that are highly leveraged should evaluate their present financial position and determine what type of transition plan they can afford without worsening their position to a point of insolvency. This will be more challenging. There are tools available from the National Pork Board and Michigan State University that can assist in comparing the cost of transition when evaluating different housing systems. However, farms will need to have accurate and reliable quotes from companies that will provide the new equipment and complete the installation, a good understanding of their own production costs and realistic expectations of what transition short falls in productivity could occur. As pork producers consider what type of feeding and housing system to implement many of the subsequent choices they have to consider will fall into place. This is a critical decision since once the type of system is chosen and installed; it can be difficult to change quickly. Does the farm want sows to consume feed in a competitive or non-competitive system? How much control does the farm want over the amount of feed offered to sows during gestation? Can the system maintain a high level of sow care and welfare? Will the system require more or specialized labour? What is the management capacity of the farm staff to learn and manage the different systems of choice? Non-competitive feeding systems are systems that allow the sow to consume feed without interference from other sows. The major types of non-competitive feeding systems are Electronic Sow Feeding and Free Access Stalls. Competitive feeding systems are systems where sows will consume feed with the potential of interference from other sows while eating. The major competitive feeding systems are floor feeding, non-gated feeding stalls and trickle feeding. However, for trickle feeding, some would contend that sows have little interference from others while feeding. Though, since sows are not protected, there will be cases where sows will interfere with others during feeding in a trickle feeding system. A more complete description of the different group housing systems was provided by Levis and Conner (2013). The five major feeding systems mentioned in the previous paragraph, are classified regarding the level of feed control, level of care and welfare, need for specialized labour and the capacity of the farm staff to manage the system in Table 1. These classifications are somewhat arbitrary and the opinion of the author, and meant more for purposes of discussion. a Dependent on the definition of care and welfare. b High is considered either the most desirable. c High is considered either the most desirable. d High would indicate the most training required. It is should be recognized that ESF does offer the greatest control of feed provided to the sow amongst all group housing feeding systems and was rated “HIGH”. This can be used to more effectively control body condition and manage feed resources of the farm. ESF systems offer other management options not discussed here. The other feeding systems were classified as “LOW” since all the sows within a pen will be offered the same amount of feed and therefore making it more difficult to manage body condition of individual sows. However, dependent on the design specifications for the sows per pen, and the farm’s ability to group sows of similar size and body condition; the argument can be made that improvements in the allocation of feed resources to sows of differing body condition can be accomplished to some degree. For example within a breeding group of sows, if sows of similar size/body condition can be grouped together, then different amounts of feed will be offered to sows within a pen dependent on size/body condition and potentially achieving some of the benefit of ESF. The classification of “Sow Care/Welfare” can be defined in many ways. For this exercise, concerns regarding feed management, sow aggression and the potential for injury were used to determine this arbitrary classification. The FAS system was classified as “HIGH” since sows can remain in the stall and be protected and only interact with other sows in the group as they choose to, unless water is not provided in the stall. The ESF was classified as “MODERATE” because of the reported concerns of regular aggression due to “cueing” or sows waiting their turn to enter the station. However, little data exists that have directly compared FAS and ESF for care and welfare characteristics. These classifications are meant more to bring to the attention of the producer, that better management may be needed to manage systems that have “LOW” or “MODERATE” classification. Farms have successfully implemented both competitive and non-competitive feeding systems. However, with competitive feeding systems, greater attention will be needed to grouping strategies, feeding strategies and daily care and observation of sows in pens. However, it is important to note that for sows housed with ESF or FAS, sows must be evaluated and their well-being status determined daily, as well. The competitive feeding systems and FAS were classified as needing similar levels of training. This is not to say that specialized training is not needed. However, with these systems most of the training will focus on daily animal management, while some training will be required to manage the feeding and penning equipment. For ESF, the staff will be required to learn how to manage and monitor the equipment as well as train the animals to use the feeders. Staff will also have to monitor the feeders and evaluate the sows daily. This will include reviewing the daily reports generated by the feeders to determine if sows consumed their daily feed allotment. Each farm will have to determine the capacity of its farm staff to manage whatever system is chosen. Employees will have to be trained to manage sows individually in groups, which will require a different level of stockmanship than when housing sows in stalls. Furthermore farms will have to determine how well farm staff can manage the equipment and the new management plan once group sow housing is implemented. Dependent on this assessment, this can weigh heavily into the decision process. Initially pork producers will have to determine if they will work within their present gestation space or add space. For the most part, gestation barns have 19 to 20 square feet per sow, including walkways. Sows in stalls only require 14 square feet so space is used very efficiently. However, with group sow housing, gestating females will have a minimum requirement of 16 to 20 square feet, dependent on their age, mixing strategy and body condition (Gonyou and Rioja-Lang, 2013). Therefore if the existing structure only has 19 to 20 square feet to start with, converting to group sow housing suggests that either the sow inventory will be reduced or an addition is needed to maintain the sow inventory. Dependent on the needs of the farm, a case can be made to reduce the inventory and therefore the number of pigs produced. Dependent on the age of the farm and grow-finish capacity, it may be beneficial to allow for an increase in sow lactation length and an increase market weight. With fewer sows, sows will be able to lactate longer and with fewer pigs marketed pigs can remain in finishing longer and be heavier at market. This could allow the farm more flexibility to access different markets. In Figure 2 is an example of the change in inventory, dependent of the type of sow feeding system and layout chosen for an example farm converted to group sow housing using only the current gestation space in the facility. For this example the percentage reductions in sow numbers, ranged from eight to 20 per cent. Dependent on the existing restrictions in the barn, the pen layout, the floor space allocation per sow and the number of relief pens provided, the percentage change in inventory could differ. A major challenge when remodeling an existing gestation barn is what to do with the sows during renovation. Some systems have developed a process than allows them to modify small sections of the barn that take two to five days at a time, dependent of sow flow. This process would continue each week, until the barn is renovated. Another option to this solution would be to reduce the sow herd by a few breeding groups in a weekly breeding system. This would allow for renovations to occur for two to three weeks in different sections of the gestation barn as the gestation “snake” moves through the barn. Modifications will still occur throughout a full gestation cycle. This challenge of what to do with the sow herd during renovation often causes the farm to add to the existing facilities. The addition to the existing facility allows the farm to build the additional space without disrupting the existing production flow. Once completed the existing inventory can be moved into the new space and subsequent renovations can occur within the existing gestation space as needed. Once the feeding system has been chosen and the fate of the sow inventory has been decided (i.e. reduce, retain or expand sow numbers), the design specifications have to be determined. Primarily this would include the floor space allocation per sow, number of females allocated per pen and number of pens for the facility, and the number of relief pens to be used. The floor space allocation per sow will be used to determine the fate of the sow inventory or if additional gestation space will be added to the farm. A general rule of thumb can be found in Table 2. These estimates should be considered a starting point to determine what floor space allocation should be. For example, the authors of these guidelines (Gonyou and Rioja-Lang, 2013) recommend that when sows are housed in small pen groups (e.g. fewer than 10) floor space allocation should be greater than when sows are housed in larger groups (e.g. more than 40). a Adapted from Gonyou, H. and F. Rioja-Lang. 2013.
b More space per sow is recommended for smaller pen groups. The number of pens in the barn will be driven by the floor space allocation provided per sow and the number of animals per pen. It should be noted that breeding groups may not always have the correct number of animals to be placed within the gestation pens available. This is of bigger concern for static versus dynamic grouping strategies. Static grouping is forming a pen group at one time without adding any more females once the group is established. Dynamic grouping is the regular mixing of sows throughout the gestation period. For static grouping strategies, pens should be filled once and sows should not be mixed multiple times. Also the number of relief pens within the barn will influence the space available for group pens. Relief pens are pens provided so that sows that may become injured or moribund can be removed from the group pen and individually cared for. In a summary of several European recommendations, it has been suggested that relief pens comprise up to five per cent of the total gestation space (Bates and Ferry, 2013). It should be noted, however, that for the most part sows are provided straw bedding in many of the European countries that have these guidelines. If sows are housed on solid cement or slatted floors the amount of relief space needed could be higher. In a review of the literature, it has been suggested that when competitive feeding systems are used for group sow housing (e.g. floor feeding, non-gated stalls, trickle feeding etc) small pen groups should be used and those pen groups should be static (Bates and Ferry, 2013). Of the two (small pen groups vs static groups) it may be more important that static groups be used for competitive feeding systems. Yet, it has been suggested that for competitive feeding systems, sows housed in small groups (10 sows) may experience less wounding compared to sows housed in moderate sized groups (20 sows) (Guthrie et al., 2012). As floor space allocation is evaluated, the type of feeding system and the number of sows per pen should be considered. In addition, having a relatively small number of sows per pen for static groups allows for sows to be sorted by size and body condition more effectively. This will allow for better allocation of feed resources to meet the needs of the animals in the pen. Simply grouping gilts with gilts, small sows with small sows, thin sows with thin sows and heavily conditioned sows with heavily conditioned sows allows for improved feed resource allocation based on the body condition and size of the sows in the pen. Also there is indication that for competitive feeding systems, grouping sows based on their ability to compete for feed resources is more advantageous for their overall well-being (Gonyou and Rioja-Lang, 2013). Changes in management and training of existing and new staff will occur when transitioning to group sow housing. Farm staff will have to learn how to manage the feeding system. The level of complexity could range from moderate (e.g floor feeding, etc) to high (e.g. ESF, FAS, etc). Regardless of the feeding system chosen, farm staff will have to quickly learn the nuances of the system and how it should be managed. If the staff does not understand how to manage the system, animal care and well-being can quickly erode. In addition, staff will have to improve their time management skills and be able to multi-task. Farm staff will also have to improve their sow observation skills and be observing sows constantly throughout the day. This will be necessary to quickly identify sows that may become compromised (e.g. lame, injured, etc.) and initiate a treatment regimen as soon as possible. A more thorough discussion can found in Bates and Ferry (2013) on this topic. As the industry changes from housing sows in stalls to group sow housing, the question will arise regarding what changes in productivity may occur. It has been reported that sows housed in groups have similar performance to sows housed in stalls (Bates et al., 2003). However, this is not the expectation across the industry. Unfortunately there has not been a definitive survey to estimate possible differences to productivity due to group sow housing. However, if nothing else most producers do expect that retention rate will be somewhat worse due to expected increases in culling rate. This is somewhat substantiated by work from Europe that suggests that sows housed in groups during gestation have a greater chance to become lame and/or injured compared to sows housed in stalls (Jensen et al., 2010). An important point to consider for producers who transition to group sow housing will be maintaining total pigs produced during the transition from individual stalls to group sow housing. There are several things to consider during the initial transition to group sow housing. If the inventory is maintained during the construction of pens, sows will be moved from stalls to pens at various stages of gestation. Dependent on their present stage of gestation, body condition, general health and well-being, mixing sows at various stages of gestation could cause an increase in sow culling. This will result in fewer pigs born in the short term due to culling of gestating sows. Another critical issue is that employee training for the new system will occur while the sow herd is moved into pens. At the same time employees are being trained to operate the system the management and environment for sows is changing. This can cause distress and anxiety for both the sows and employees. This can cause increases in culling as both the sows and employees adapt. This can be especially critical for more complex systems such as trickle feeding, Free Access Stalls and Electronic Sow Feeding. Before the transition occurs, a plan should be formulated on how this transition will occur and how employees will be trained to manage the new system. Pork producers should be able to adapt to group sow housing with minimal changes in productivity in the long term. However, to be successful, planning must be done carefully to provide the necessary system configuration and training for the farm to maintain its overall productivity. Pork producers must first determine if they plan to reduce, retain or increase their sow inventory and from that decision, determine what will be best for the farm business to be viable in the future. Persons wanting more information regarding different aspects of group sow housing are encouraged to go the National Pork Board web site on sow housing. Acknowledgements: The author wishes to acknowledge Dr Don Levis and Dr. Harold Gonyou for their contribution to the formation of many of the ideas discussed in this manuscript. Bates, R.O., D.B. Edwards and R.L. Korthals. 2003. Sow performance when housed either in groups with electronic feeders or stalls. Livestock Production Science. 79:29-35. Bates, R.O. and E. Ferry. 2013. Group housing systems: production flow and management. 2013. National Pork Board Group Housing factsheet. Gonyou, H. and F. Rioja-Lang. 2013. Group Housing Systems: Floor Space Allowance and Group Size. Guthrie, T.A., R.O. Bates, E. Ferry, D.W. Rozeboom, G. May and B. Barton. 2012. Wound score comparison among gestating sows housed in two different group sizes on a commercial farm. J.Anim. Sci. 90 (E-Suppl. 2): 222P. Jensen T.B, M.K. Bonde, A.G. Kongsted N. Toft, and J.T. Sorensen, 2010. The interrelationships between clinical signs and their effect on involuntary culling among pregnant sows in group-housing systems. Animal. 4:1922-1928. Levis, D.G. and L. Conner. 2013. Group Housing Systems: Choices and Designs. National Pork Board Group Housing Factsheet. Bates R.O. 2014. Converting to group sow housing - decisions to consider. Proceedings of the London Swine Conference. London, Ontario, Canada. 26 to 27 March 2014. p58-65.